Embattled City Board of Elections Executive Director Michael Ryan testified before the City Council's Committees on Oversight and Government Operations on Tuesday, explaining that a perforated two-page ballot, never before used anywhere in the United States, was primarily to blame for the issues at polling sites across the city on Election Day. In a combative hearing initially presided over by City Council Speaker Corey Johnson, Ryan apologized, after being asked to do so, for the poor administration of the general election but defended the BOE by noting it was forced to work under tight timelines and restrictive administrative law, which required the center perforation on the two-page ballot and did not allow ballot questions, of which there were three this year proposed by the mayor’s Charter Revision Commission, to appear on the same side as candidates. These problems included malfunctioning scanners without adequate tech support to fix them and lines so long that some voters simply went home without casting a ballot. The timing of the submission of the ballot questions proposed by the Charter Revision Commission caused the ballot to not be finalized until October 9, and the hundreds of different "ballot styles" across various different overlapping jurisdictions for different offices, prevented adequate testing and the ability to upload different styles on the same machine, Ryan said. In Manhattan alone, there were 924 different ballot styles, Ryan testified, owing to the various different combinations of overlapping districts for different offices such as Senate, Assembly, and Judgeships, among others. Staten Island was the lone borough with a single sheet ballot, and did not experience the poll site issues that the other four boroughs did on Election Day. 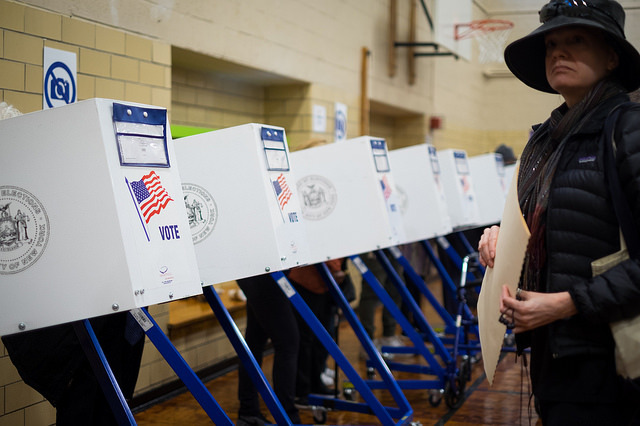 Though still only about 38 percent, voter turnout in New York City for the general election was substantially higher than in recent non-presidential elections. Ryan said that state law dictates that there must be one scanner for every 4,000 voters, while BOE protocol stipulates one scanner for every 1,400 voters. Because of both the abnormally high turnout and the two-page ballot, which when separated doubled the amount of paper that machines needed to process, “ballot bins” in the voting machines filled up much quicker than normally. In fact, most of the issues were related to simple overcapacity of ballots in the bins, rather than technical malfunction, Ryan said. Ryan noted that about 4,000 scanners were in use on Election Day, while about 1,000 were left in the warehouse; they could not be brought out to poll sites due to transportation issues and the fact that individual ballot styles take an hour to upload onto the machine’s ballot reading software. Ryan said that a two-page ballot was considered a possibility in 2016, but was ultimately not used. Nonetheless, Ryan was criticized for not testing a "generic" perforated ballot in that two-year span. In fact, Ryan said that the Board did not test for potential malfunctions at all, citing a lack of adequate time between the ballot finalization and Election Day and the inability to predict voter behavior. Speaker Johnson, who called on Ryan to resign during the Election Day fiasco, expressed displeasure and distrust in Ryan but also condemned the election process in New York generally. “I am embarrassed as a New Yorker about what happened on Election Day,” Johnson said. “I feel like this happens over and over and over again. I can’t remember an election where people said ‘you know what, it was done in a thoughtful, calm, professional, easy manner.’ New Yorkers deserve that. I don’t have confidence that that is gonna happen.” Johnson noted that he is not confident that the Board can competently administer the upcoming special election for Public Advocate, likely to occur in February. Johnson was just one of several Council members to detail his own experience voting, noting that his polling place had only a single functioning scanner by 11 a.m., resulting in a significant line that stretched outside into the rain, which was another factor in the day’s issues. "I expect to hear a plan forthcoming from the city and the state to rectify the issues of this election, and to improve tenfold the election operations for the next election, and the one after that, and the one after that," Johnson said. Another problem beyond ballot design and machine capacity was staffing, which failed on multiple levels on Election Day, ranging from poll workers unable to handle the influx of voters or scanner malfunctions or a greatly deficient number of tech support workers to fix the mounting issues with the machines. The BOE supplied tech staff commensurate with the number staffed in the 2016 presidential election, which Ryan called a bad idea in retrospect. "There was an avalanche early in the morning and we just could never catch up,” he said. Ryan disclosed that the BOE had received nearly 10,000 calls on Election Day, with most related to technical issues, a number he said was much higher than previous elections. The problem was most significant in Brooklyn, where the Board fielded 3,362 calls and wait times for a technician averaged an hour and 15 minutes. The average wait time citywide was 52 minutes. Ryan, who is hired by the city BOE to run operations and be non-political, did not take an explicit position on some of the more talked-about election reform proposals for the state, such as early voting, no-excuse absentee voting, or automatic voter registration. However, he urged Council members on multiple occasions to work with the Board to establish a municipal poll-worker program modeled on a similar program in Los Angeles, where municipal workers at city agencies would get a bonus or a day off to work the polls. This could include techs from the city’s technology department, DoITT, or other agencies, who could supplement the existing tech support workers. In the meantime, however, Ryan wants to staff poll sites in future elections with workers trained to fix malfunctions, rather than relying on a finite number of outside techs. 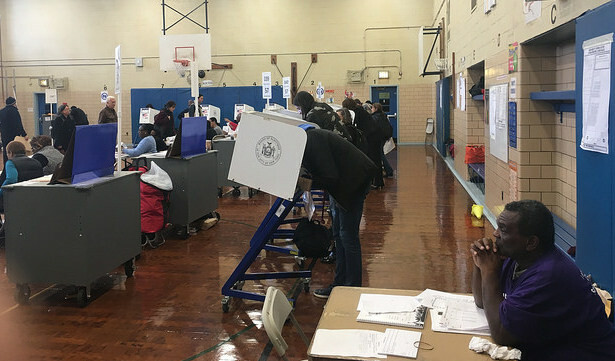 Brooklyn Council Member Kalman Yeger questioned why the existing poll workers themselves couldn’t be trained to clear ballot jams, comparing the issue to a printer malfunction. "You make a straightforward and reasonable suggestion. The reluctance going back to 2010 was that we were losing poll workers because of their fear of the new machines,” Ryan said. “So a decision was made in that moment, which carried through to this election, have the poll workers do less with the machines, not more. This election, in a very hard way, taught us a difficult lesson." Other testifiers, such as Douglas Kellner of the State Board of Elections, agreed with the municipal poll worker suggestion, while also suggesting that staffing in general needed to be improved to comply with the “30-minute rule,” a federal rule which stipulates that no voter should wait more than 30 minutes to vote. Though with looming new political dynamics as a backdrop, the Assembly Election Law Committee and Election Day & Voter Disenfranchisement Subcommittee held what is a typical post-election hearing to discuss how to improve voting in New York, where for years the state has had some of the most regressive laws in the nation. The legislators present and those testifying focused specifically on early voting and no-excuse absentee voting as key reforms on the table, but often deviated towards criticism of the state’s entire election structure, with accompanying calls for comprehensive reform. New York is one of only a small number of states that does not have early voting or no-excuse absentee voting, and has the strictest party registration deadline in the country. There appears to be unanimity among Democrats about moving ahead with early voting. And while research on whether it improves turnout is mixed, it would likely foster a more diverse group of voters, who would not have to take off work to vote, and would allow election administrators to diagnose and correct problems, such as the two-page ballots that led to problems at the polls in New York City last week, at an early stage in the process. New York’s voting laws once again came to the forefront on Election Day, when issues at the polls led to long lines and numerous people leaving before voting. The fiasco renewed calls for reforms, particularly early voting, which some argue could have made a significant impact, as well as better election administration through professionalizing the city Board of Elections. The Assembly has on numerous occasions passed voting reforms such as one week of early voting, and Governor Andrew Cuomo included a two-week early voting period in his budget proposal last year, but efforts have annually been stopped by the Republican-controlled State Senate. With control of the Senate turning over to Democrats based on last week’s election results, early voting appears poised to become reality in the state. Committee Chair Charles Lavine said, given the new dynamics of state government, the Legislature has a “unique opportunity to enact meaningful reforms,” including early voting and no-excuse absentee voting. Two commissioners and two executive directors of the State Board of Elections testified on Thursday, and all adopted a reformist tone, though the Board is not known as particularly progressive with regard to pushing changes to make voting easier in New York. Robert Brehm, one of two executive directors, said that New York’s unusually high turnout this year put a strain on the voting system, and that early voting would mitigate the stresses of high turnout and other factors such as inclement weather and a complex ballot. Brehm and the commissioners noted several elements of early voting and absentee voting that need to be addressed for them to work, including making sure that voting rooms are adequately staffed and have enough equipment, and that the use of snail mail for absentee votes doesn’t prevent votes from being counted, as it has in the past. On the mail front, Brehm endorsed a bill in the Assembly that would allow voters to apply for absentee ballots online. Andrew Spano, one commissioner, signaled support for early voting while also casting aspersions on the entire system writ large. 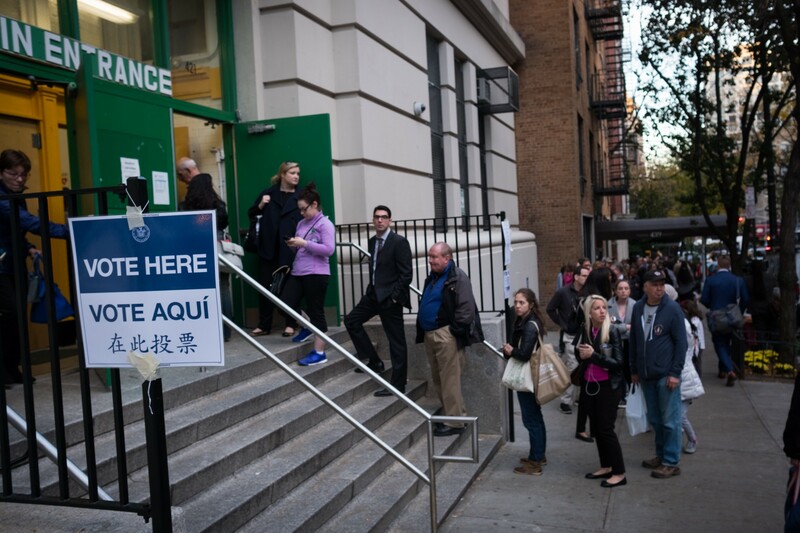 The commissioners noted that early voting was not a “panacea” solution to the problems afflicting New York elections, but that as part of a package, it could help improve the situation. Other proposals included electronic poll books and the abolition of election districts, to be replaced by poll sites as an administrative unit with books organized alphabetically instead of geographically. They also signaled support for automatic voter registration, despite possible issues with implementation regarding individuals who relocate. 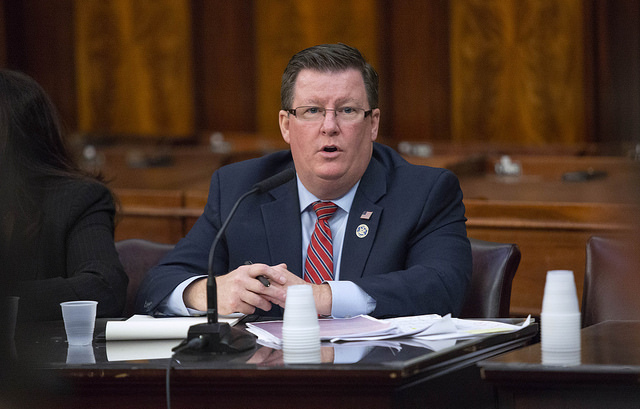 The hearing was also an opportunity for Assembly members to unload on Michael Ryan, the embattled executive director of the New York City Board of Elections who has shouldered much of the blame for the administrative failures on this past election day and others. Assemblymember Robert Carroll of Brooklyn told of his experience on Election Day. At his polling place, 350 people were stuck in line for several hours after each machine at the site broke, he said. After Carroll contacted the board, a tech was sent to fix the problem, but the machines continually broke throughout the day, leading to scores of people leaving poll sites without voting. Ryan argued that the issues this year were a result of both unusually high turnout (though it was still under 40 percent in the city) and other aggravating factors, including inclement weather, and a perforated two-page ballot that led to jams when voters didn’t submit them correctly. He noted education efforts were designed on short notice and inadequate, and endorsed ideas for improving the process such as having workers from municipal agencies act as poll workers or better storage for emergency ballot procedures, as well as early voting. 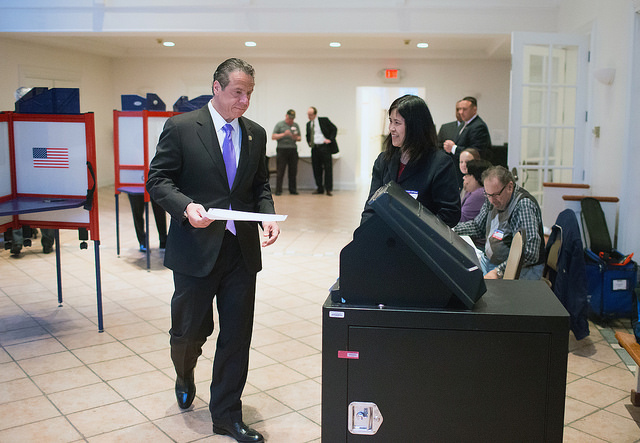 Governor Andrew Cuomo announced on Tuesday new measures to enhance the security of the state’s elections. They include “comprehensive risk assessments, intrusion detection devices, and managed security services for all county boards of elections,” as well as training for election staff on cyber security. The initiatives make use of $5 million allocated in the 2019 state budget for enhanced cybersecurity related to elections, which included the creation of an “election support center” and an “election cyber security toolkit,” provides “cyber risk vulnerability assessments” for state and local Boards of Elections, and requires BOEs to report data breaches to the state. The announcement comes in the wake of the indictment of 12 Russian nationals for interference in the 2016 presidential election, involving the theft and release of emails from the Democratic National Committee and Hillary Clinton campaign chair John Podesta. A news release from the governor’s office said that the state would solicit contracts in the coming days for the risk assessments, intrusion detection devices, and security services for county boards of elections. The broader issue of election security has become increasingly prominent in the wake of the 2016 election and the allegations of Russian interference. Cuomo’s announcement of new election security measures came just a few hours after a Tuesday panel at City & State’s Protecting NY Summit, moderated by Gotham Gazette’s Ben Max, where panelists discussed the issue as it relates to state and local elections in New York. New York is in the midst of a busy election year that features races for all of its statewide state-level positions, all of its state legislative seats, one U.S. Senate seat, and all of its House of Representative seats, among others. The panel consisted of State Senators Todd Kaminsky and Liz Krueger; Assemblymember David Buchwald; Michael Ryan, executive director of the New York City Board of Elections; Eric Hodge, of cybersecurity firm CyberScout Solutions; and Eva Guidarini, a member of Facebook’s U.S. Politics and Government Outreach team. In something of a twist from how New York’s dysfunctional elections are usually discussed, the state’s election security measures in the wake of the 2016 election were highly praised by the panelists. Unlike many states, New York never abandoned paper ballots so as always to leave a “paper trail” in the event of a hack. 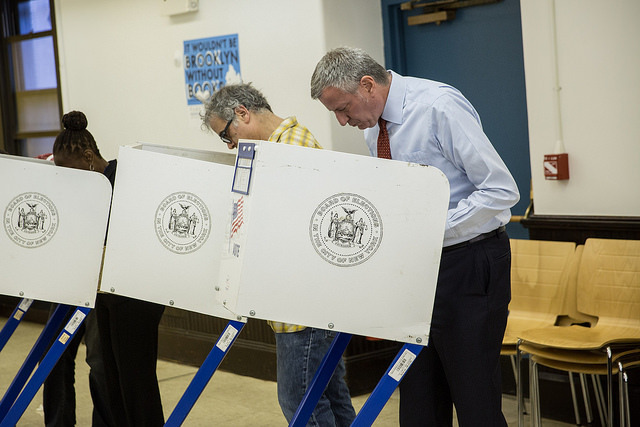 New York’s voting machines are also not “networked,” but rather are all independent machines. This makes it impossible to hack the entire system or even the machines. Still, in the event of a hack, the city and state may still be underprepared. Ryan suggested that the BOE may be due for an increase in staffing to supplement its monitoring services. Senator Krueger, a Manhattan Democrat, ranking member of the Senate finance committee and a member of the elections committee, said that the focus should be not just on whether the 2016 elections were meddled with, but when and how it would happen again, in 2018 and beyond. “Rather than talk about the fact that, apparently, they are hacking our elections, and we have to assume we’ll have future elections hacked, I think the lesson from yesterday, I agree, the timing was perfect for this discussion, was if you don’t have any faith that your elected officials are going to follow the law and uphold their duties and responsibilities, we are in serious trouble as a state, a city, or a country,” Krueger said, in reference to the press conference held by President Donald Trump alongside Russian President Vladimir Putin. 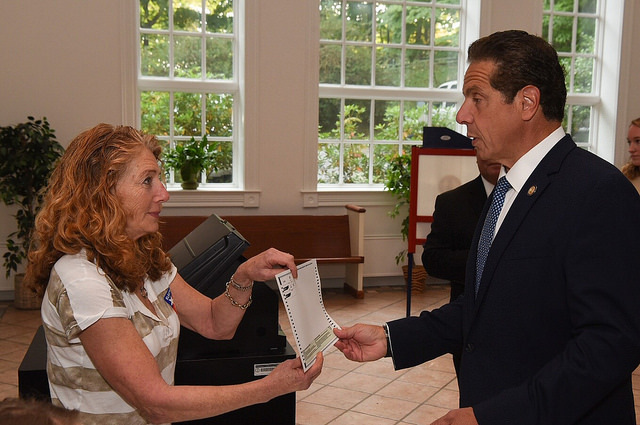 Twice during the hour-long discussion, Krueger stressed that New York has never adopted electronic-only voting systems, instead opting to leave the paper trail to ensure votes are counted. She explained that she had been part of the fight to ensure paper ballots were still used as many other states were moving to digital-only, which has come back to haunt them. Ryan noted that the 2016 election-related hacking led the BOE to conduct, for the first time, election security exercises and simulations meant to quickly and efficiently identify and neutralize threats. Asked whether New Yorkers should stop expecting immediate and secure election results, Ryan demurred. Kaminsky said he would love to see Long Island election night results come in more quickly, like New York City is able to do. Ryan indicated that if there was a vulnerability to hacking it would be in the uploading of results from polling places to the BOE, and that if a bad actor was intent on causing some "chaos" they would possibly be able to do that for a short period of time, but that systems, while expensive, are in place to mitigate any effects fairly quickly. There may be some temporary confusion, he said, but it would be quickly corrected. “If there is a problem,” Ryan said, “we have backup systems in place. We can leverage police department personnel to shut down the uploading of the results from the poll sites, and shift that to the local police precincts.” Ryan said that BOE sytems are now constantly monitored throughout the year through work with New York City's technology department. Krueger kept to her admittedly skeptical theme by recounting an anecdote of first-year computer science students successfully breaking into voting machines in Ohio within an hour-and-a-half. “When everyone who takes the college computer class can do it in the first hour and a half, you should be very, very worried,” she said. Hodge, whose firm is hired by governments to sure up their cyber security and election systems, said that along with the voting machines and election results, the voter databases and rolls should be protected and secured as well. He also said that policymakers should prioritize being able to detect problems immediately, and that New York carefully vet election vendors to ensure that security is prioritized. "Thankfully," Assemblymember Buchwald said early in the program, "we've had a fairly proactive approach here in New York, not to toot my subcommittee's own horn, or the entire Assembly election committee, but we've actually had already two public hearings on election security, the most recent of which was this past November after the local elections. And if you were at the hearing, if you watched it online, you would have heard the words 'Cambridge Analytica' four months before they became national news." Governor Cuomo’s announcement of new measures comes on the heels of a new law aimed at securing the state’s elections passed earlier this year. The law prohibits foreign entities from forming independent expenditure (IE) committees to buy ads on social media, requires ad buyers on social media to register as IE committees and for the name of the IE that bought the ad to be clearly displayed, and requires the State BOE to make political communications more transparent and accessible. In April, the New York City Board of Elections received a late delivery of 1,077 pieces of mail from the United States Postal Service, including what turned out to be 828 absentee ballots cast in the 2017 municipal elections. Of those, the BOE found 533 valid absentee ballots never counted, effectively disenfranchising hundreds of voters through no fault of their own, all of whom were attempting to vote in Brooklyn. According to Ryan, the board received a trove of correspondence in April, including the 828 absentee ballots that had been filled and mailed in by people registered to vote in Brooklyn. Many of the ballots, 295 to be exact, had been postmarked after November 7, the date of the general election, or had illegible or missing postmarks, which meant they would have never been counted. For a ballot to be valid, it had to have been marked before midnight on Election Day and would have to be received by the board no later than seven days after the election. “In any event that leaves us with 533 individuals who timely delivered their ballot to the post office and for whom the post office did not timely deliver the ballot to the Board of Elections,” Ryan said. The BOE, which has faced withering criticism for its own failures in election and ballot management in the past, seems blameless in this particular situation. And though the USPS conceded its guilt in an official letter to the BOE, officials offered no plausible explanation of why the hundreds of ballots were simply set aside at a processing facility in Brooklyn for five months before being discovered and subsequently delivered. “They were all first class pieces of mail. So the Board of Elections was under no obligation whatsoever to pick any of that mail up from the facility. It was and remained the Post Office’s responsibility to deliver the mail to us,” Ryan said. Many of the ballots, he noted, came from university towns such as Rochester and Ithaca, likely meaning they were cast by college students who hailed from the borough. They were also spread out across the borough, meaning they were unlikely to have had a significant effect on any one race. “Not that it made it appreciably better, but if it was something that occurred across the board and didn’t disproportionately impact one district over another, that was certainly better than a circumstance of having them all be concentrated in one area and then potentially cause the outcome of an election to be questioned or reconsidered,” Ryan said. The 2017 general election in the city included races for the three citywide seats, including mayor, as well as the borough president positions and all of the seats on the City Council. Of those, there was only one remotely close general election for voters in Brooklyn, for City Council in the 43rd district, where Democrat Justin Brannan won by 794 votes. Ryan insisted that he received assurances the postal service would avoid repeating its mistake and will correspond directly with the BOE’s central and borough offices. “My conclusion is that the Brooklyn borough staff [of the BOE] did everything that they could possibly do to service the voters in this respect and this happens to be a mistake by the U.S. Post Office,” Ryan said. It was clear that Ryan was sensitive to how blame might be apportioned, particularly since the Brooklyn office was responsible for illegally purging thousands of voters from the rolls in 2016. He also said that, though it was not required, the BOE would in the future send staff to local post offices to pick up bulk mail deliveries during peak election time. For those whose ballots were not delivered, the BOE will send out individual mailers to inform them that their vote did not count, Ryan said, and their individual voting record will also show scanned copies of their returned envelopes and the post office’s letter of explanation. “Unfortunately under these circumstances there is nothing the Board of Elections could have done any differently,” he said. With a 16-hour workday, compensation at $200, and the monotony of sitting in what is often a stifling, public-school gymnasium, New York City’s tens of thousands of election poll workers have a largely thankless job. Mobilized only a few days most years, they are often retired or semi-retired. While unheralded, they are the frontline for the New York City Board of Elections (BOE), which, as governed by state law, is responsible for registering voters, maintaining voter records, and operating poll site locations throughout the five boroughs. Many, motivated by civic duty, extra income, or both, apply directly via mail or through the city BOE website. However, a substantial portion of poll workers receive their positions through recommendations from local Democratic and Republican leaders, chosen before the BOE dips into the general application pool. The parties also nominate the commissioners to the city Board of Elections, one Democrat and one Republican per borough, and each borough has a satellite operation for election administration. The injection of political partisanship into the cogs of the electoral process, especially in the wake of a critical audit of the BOE by the city’s Comptroller’s office, has come under increased scrutiny in 2016 and 2017, both years seeing a bevy of election activity in New York. Some City Council candidates and campaign staffers allege that the influence of local party leaders in hiring and placing poll workers can advantage those backed by county leadership. Benefits range from having sympathetic eyes in polling sites to—at boldest—an extra set of hands to electioneer on election days, influencing votes as they are cast. The current system is “a cocktail of corruption that’s impossible for these people to not get drunk on,” concluded an experienced Democratic political operative who has worked on high-profile issues and campaigns and wished to remain anonymous for fear of impacting his political career. “To my knowledge, I know there is a history of local poll workers affiliated with campaigns being placed in specific polling sites,” said Brian Cunningham, a City Council candidate in Brooklyn’s District 40 who is currently pursuing legal action after reports of irregularities at polling sites across his district, where incumbent Mathieu Eugene won a third term in November and is alleged to have illegally been in several polling places on Election Day. While a few dozen corrupted votes would not typically change the outcome of an election, they would cast a pall over the voting process and can impact contests decided by small margins. For example, Elizabeth Crowley, a Democratic incumbent in Queens District 30, lost her City Council seat to Republican Robert F. Holden in the November general election by just 137 votes. Despite concern from several experienced political operatives and recent City Council candidates, Democratic Party officials from Manhattan and Brooklyn argue that widespread allegations of poll workers influencing elections are overblown. Meanwhile, some candidates have reported no knowledge of what others allege is common practice. “[This] is not a claim that I can neither confirm nor deny," said Deidre Olivera, an unsuccessful 2017 Democratic City Council candidate in District 41, in an email to Gotham Gazette. Although sources did not provide hard evidence of candidate campaigns or local party leaders deliberately influencing elections through the recommendation of partisan poll workers, the spectre of compromised poll sites adds further fuel to the fire for reformers calling for a wholesale revamp of state election law, including the structure and practices of the state and city BOE. The BOE is crafted along partisan lines in order to guarantee impartiality, or at least opposing partialities. In New York City, this partisan structure extends from executive leadership through mid-level staff, spreading its roots into how poll workers are found and hired. According to conversations with Michael Ryan, the executive director of the city BOE, and political insiders, poll workers are either recruited based on applications sent directly to the BOE or they are selected by the local Democratic or Republican parties. Party-selected poll workers are chosen by district leaders, or local party officials from state Assembly districts. Poll workers nominated by district leaders are always chosen before workers culled from the general application pool. The BOE, according to state law, cannot question the credentials of workers forwarded to them by district leaders, explained Ryan, the executive director. “It’s up to the local party’s discretion who they want to designate and it’s not for us to question,” he added. Ryan’s position is an administrative hire made by the BOE board, meant to be a nonpartisan leader for BOE operations. The district leaders also have sway over which poll workers are placed where. “From having seen this from the very most ground level, the district leaders have the most influence in recommending where to assign a poll worker the BOE has already hired,” said Barry Weinberg, executive director for the Manhattan Democratic Party. Adding to the control Democratic party officials have over the assignment of poll workers is a quirk of staffing process called, per Ryan, “cross-designation.” The vast majority of poll sites need an equal number of Republicans and Democratic poll workers manning them. When poll sites are lacking enough Democrats or Republicans, the BOE asks “individuals who might be registered in a different political party to take an oath as a poll worker or inspector for the party with a shortfall,” said Ryan. Ryan confirmed that, given the outsized number of Democrats compared to Republicans in New York City, usually Democrats “cross-designate” as Republicans. The poll-worker and election-administration processes seem flawed to many political candidates, including Randy Abreu, a 2017 Democratic City Council candidate in District 14 in the Bronx. After the September primaries, Abreu cried foul after receiving multiple tips from friends, supporters, and voters of problems in the polls across his district, reported The Riverdale Press. In an interview with Gotham Gazette, he elaborated. “My male district leader was my opponent’s campaign manager. The district leaders, if they have a relationship [with a candidate], it’s human nature they’re going to appoint friendly people on election day in the poll sites,” Abreu said. Whispers were not limited to the Bronx. In Manhattan, Ronnie Cho and Jasmin Sanchez, two Democratic City Council candidates in District 2, were also surprised by the appearance of other candidates’ supporters in the polls during primary day. The party establishment’s favored candidate was Carlina Rivera, an aide to the outgoing, term-limited Council Member, Rosie Mendez, who won the primary and general elections by wide margins. Sanchez observed that most people working the polls in her district were affiliated with political clubs and organizations, which endorse candidates. “Everyone I know that has worked the poll sites are connected to political organizations and nonprofits,” she said. “The appearance can seem a little bit awkward,” said Cho, in regards to the supposed impartiality of polling sites. Although multiple City Council candidates were aware of these concerns, none could provide detailed accounts of poll site manipulation. Campaign staffers who spoke with Gotham Gazette similarly provided no specific accusations. However, they either thought the allegations were credible or directly confirmed the existence of the phenomenon. All requested anonymity for fear of causing damage to their careers or receiving political retribution. Others directly attested that campaigns backed by the party enjoyed the benefits of supporters working the polls. “The short answer is yes, yes, yes, yes,” said a political staffer who has also worked on multiple uptown campaigns in an email to Gotham Gazette. A different, experienced Democratic political operative who has worked on high-profile issues and campaigns confirmed poll site manipulation with similar enthusiasm: “Yes, and Santa Claus is not real. This is something I’ve witnessed firsthand,” the operative said. For most campaigns, having poll sites manned by supporters is understood to be an implicit advantage, he explained. In fact, he said the practice has benefitted his own career, but that the relevant campaigns “never explicitly” coordinated with the local Democratic Party. Despite concerns from candidates and staffers that party-backed campaigns are rejiggering the cogs of the electoral system in their favor, other political insiders—including previous candidates, observers, and party officials—have either never caught wind of this phenomenon or believe the rumors to be nothing more than hot air. Kim Moscaritolo, the female district leader for the 76th Assembly District and a longtime political activist, said that she couldn’t confirm or deny these allegations. Others think these claims, while hypothetically possible, are unlikely. “In theory, that might be true. In my years, I’ve seen very little evidence. I’m skeptical about most allegations of election fraud,” said Jerry Skurnik, partner at consultancy Prime NY, which specializes in election data, and a longtime political aide and observer in New York. And Democratic party officials in Manhattan and Brooklyn adamantly deny that anything more nefarious than the occasional poll site mishap may occur during city elections. Weinberg, of the Manhattan Democratic Committee, said that at least in Manhattan, these allegations of poll worker bias and electioneering are “definitely overblown.” He also expressed faith in the current system. “The laws are written with mistrust. The system is almost designed to be adversarial,” he added. According to the BOE, approximately 60% of poll workers are found through general applications and 40% are selected by district leaders. The number of party-designated poll workers forwarded to the BOE has been steadily trending down the past few years, said Ryan, the executive director. Last year, the BOE purged approximately 125,000 Democratic voters from the voting rolls in Brooklyn without explanation, And after the September 2017 primaries the BOE changed more than 20% of its polling sites since 2016, regularly breaking city law by not posting notices of the changes. And this past November, city Comptroller Scott Stringer released a damning audit of the BOE, reporting that 90% of the 156 poll sites observed during three elections since April 2016 had significant problems—including severe infractions of election law, most notably instances of electioneering by poll workers. She argues that the BOE should be “professionalized,” meaning the board’s posts should be filled not through political appointees, but publicly advertised job postings. “We believe that the Board of Elections should be a nonpartisan, professional operation,” said Lerner. Tweak the BOE or Revamp It? For Michael Ryan and party elites, the BOE needs help, but not wholesale reform. Ryan said that one of the BOE’s biggest challenges right now is finding poll workers willing to work the long hours for low pay. However, these problems are not unique to New York City. He referenced a report released in January 2014 by the bipartisan Presidential Commission on Election Administration that detailed widespread shortages of poll workers across the country. Weinberg, of the Manhattan Democrats, agreed that finding more poll workers was the most pressing obstacle to well-run elections, suggesting that paying them more money would incentivize more people to apply. For reformers like Ben Kallos, City Council member for Manhattan’s District 5 and chair of the Council’s government operations committee, the problem is simple. “I don’t believe people should get jobs in government because of who they know,” he said in a phone interview. He urged anyone with allegations of campaigns inserting supporters into poll sites to speak up, including through the city Department of Investigations. “We’re calling upon them to do their civic duty,” he exhorted. WNYC radio’s Brigid Bergin reported last week that more than 78,000 affidavit ballots, out of 168,000 cast by voters whose names were not listed in voter rolls in last year’s presidential election, were disqualified by the BOE and the board did not notify those voters in time for them to challenge those decisions in court and possibly have their vote count. Voters fill out affidavit ballots when they believe there is a mistake about their enrollment status, typically when their name is not in the sign-in book when they show up to cast a ballot. If it is not counting an affidavit vote, the law requires the board to notify affidavit voters immediately by mail and those voters have 20 days to appeal. But, as WNYC found, the board only began sending notifications two days after that deadline passed and was still sending some as of last week -- six months after the election. 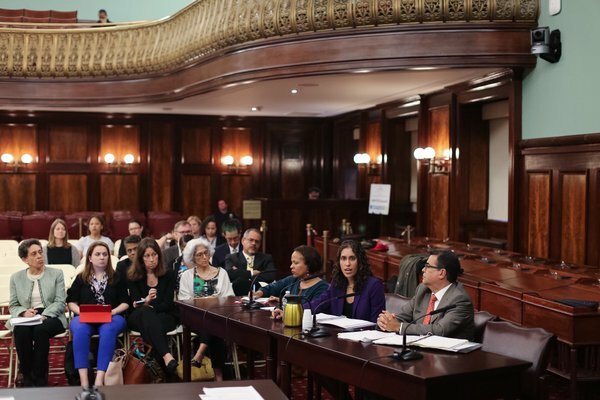 Friday’s City Council hearing of the Committee on Governmental Operations was part of the ongoing round of hearings on Mayor bill de Blasio’s executive budget proposal. A new fiscal year 2018 budget is due by July 1, with the mayor and the Council needing to agree on a spending plan by then. While the BOE is governed by state law, it is funded through the city budget and the City Council has oversight. The mayor and Council have virtually no control, though, over BOE operations and personnel. The government operations committee, chaired by Council Member Ben Kallos, met to discuss the BOE’s $136.5 million proposed budget for the 2018 fiscal year. Council members sought answers from the board about the latest WNYC report, which came after a series of reports by Bergin exposing problems at the BOE, including tens of thousands of voters purged from the rolls ahead of the presidential election. Kallos said his wife was one of those voters whose vote did not count, and that she received a notice from the BOE just last month. “There is a quasi-manual, quasi-automated process,” said Michael Ryan, BOE executive director, insisting that the board could not send notices to voters who aren’t in the system until they provide relevant missing information to the board. He insisted that notifications could not be sent out to voters until the election was certified, which was done December 6 last year, nearly a month after Election Day. And the 20-day deadline to challenge a decision on a vote, he said, was a state legislative matter rather than one for the board. 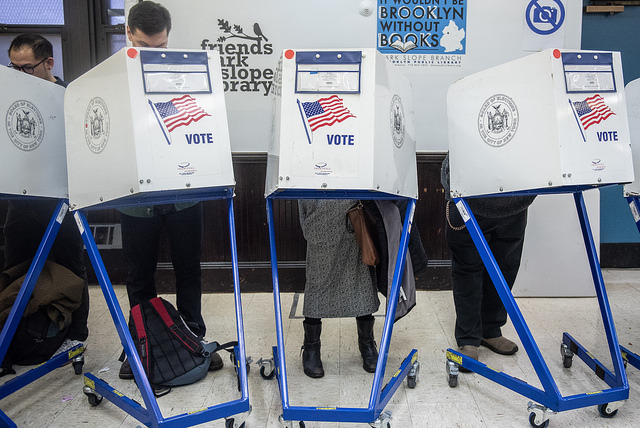 Many eyes will be on the New York City Board of Elections come Tuesday as New Yorkers head to the polls for the second time this year, casting their votes in congressional primaries. The first election, April’s presidential primaries, was so problematic it prompted multiple city and state authorities to launch investigations into the city BOE and caused Mayor Bill de Blasio to offer an extra $20 million in funding for the agency, conditional upon the enactment of certain reforms. The BOE is comprised of ten commissioners, five from each of the two major political parties, two from each borough, who are (traditionally) appointed by the county party chairs and approved by the City Council. The commissioners then appoint staff to the city’s BOE and have authority over all city BOE employees, including the executive director, currently Michael Ryan. As of June 7, the 120,000 Democratic voters in Brooklyn who were mistakenly purged from the voter rolls have been restored in an attempt to avoid again disenfranchising those who had been turned away or forced to sign affidavit ballots during the primary (90,000 of 121,000 affidavit ballots were rejected and will not be counted). Two employees at the Brooklyn BOE office have been suspended without pay pending an investigation into why the names were incorrectly removed from the voter rolls in the first place. The BOE has yet to accept de Blasio’s $20 million offer, likely out of reluctance to adopt the reform plan attached to the funds, which includes improving poll worker training and hiring an outside consultant. The BOE did not respond to requests for comment for this article. As evidence of BOE incompetence, cronyism, and corruption has mounted over the years, few seem to know where to direct their ire. The changes in state law that de Blasio referenced were not part of the discussion in Albany as state legislators and Gov. Andrew Cuomo negotiated end-of-session deals earlier this month. Since the presidential primaries, New York State Attorney General Eric Schneiderman has opened an investigation into the BOE and New York City Comptroller Scott Stringer has launched an audit into the agency’s operations and management, calling the BOE “consistently disorganized, chaotic, and ineffective.” City Council Member Ben Kallos, chair of the Council’s government operations committee, has promised to hold an oversight hearing on the BOE, though he also grilled BOE officials at the agency’s executive budget hearing May 13. “Hope springs eternal,” Kallos replied dryly when asked if he believed the heightened scrutiny the BOE is currently facing would help to bring about any changes to the way the agency operates. “I hope that by bringing the commissioners to the City Council to be held personally accountable, we may get the change we are seeking,” Kallos said. Tensions have remained high since April's primaries, with voters consistently attending weekly meetings held by the BOE to express their frustrations and demand answers. Dozens of angry voters showed up at the Voter Assistance Advisory Committee’s May 17 hearing on issues with the primaries, and many who testified were livid, speaking in loud and frustrated tones about the obstacles they encountered trying to cast their votes, as well as the treatment they faced from BOE officials during a hearing held by the BOE on May 3. Many who testified were irate that they had been forced to sign affidavit ballots - they knew they were registered to vote, having previously voted in New York city and state elections, they said. Issues at the BOE aren’t just about the recent Brooklyn voter purge, which was discovered by WNYC. Other primary day problems were indicative of long-standing BOE problems: missing ballots, missing voter rolls, broken ballot machines, poll workers showing up late or giving incorrect instructions. The BOE also sent tens of thousands of newly registered voters notices with the incorrect date for upcoming state and local primary elections. The BOE performance around the April primaries reinforced its reputation for dysfunction. Key questions now linger more forcefully ahead of Tuesday’s congressional primaries, September’s state-level primaries, November’s Election Day, and the 2017 city-level elections. Chief among them are who actually holds the BOE accountable and how must the BOE be reformed? Before Michael Ryan was just barely appointed in 2013, the city BOE went without an executive director for three years, as the party-split commissioners were unable to agree upon a replacement for the former executive director, George Gonzalez, who was fired after a series of failures administering the 2010 September primary and additional mistakes leading up to the general election. The Mayor can use his budget powers to try to force change at the BOE. The City Council can hold oversight hearings examining how the BOE operates. The city’s Department of Investigation can investigate the BOE and recommend reforms, which it did in 2013 when it issued a report identifying fundamental flaws and recommending over 40 reforms to improve the agency (which the BOE largely ignored). The city’s Conflicts of Interest Board also has some oversight, and has fined BOE employees for hiring members of their own family in the past. Additionally, the city Comptroller’s office has the power to audit and investigate the BOE, which can make the agency’s operations and finances more transparent and accountable, since the BOE is funded by the city (though the laws that mandate its structure and duties are controlled by the state). Stringer’s office released an audit on June 6 of BOE inventory practices for office equipment and voting machines, and is currently conducting another audit of BOE operations and management. The June 6 audit revealed that the BOE's inventory records for both voting and office equipment "were incomplete and inaccurate," as well as "numerous instances of noncompliance" with other inventory practices, including "the existence of duplicate serial numbers" and "more than 1,000 items" on-site that had been omitted from the BOE's inventory records. The Voter Assistance Advisory Commission, which advises the city’s Campaign Finance Board on voter engagement efforts and recommends changes to improve elections, passed a resolution at its May 17 hearing to compile election irregularities and systemic problems and relay them to BOE, to everyone currently investigating the agency, and to the City Council. Yet, true to it’s name, VAAC can only serve in an advisory capacity, and can take actions to facilitate voter registration, but, like the DOI and other agencies with oversight capacities, is essentially powerless to bring about any meaningful structural reform at the BOE. “At the end of the day, what really has to change is state law,” said Eric Friedman, assistant executive director for public affairs at the CFB. “The problem is, it’s all reactive,” State Senator Michael Gianaris, a Queens Democrat, told Gotham Gazette. “Something has gone wrong, and then the appropriate government agencies act - entities that fund the board can try to extract reforms.” Yet “what is really needed is to reform the structure of the board,” Gianaris added, referring to the patronage system at the BOE through which employees are appointed by the board’s ten commissioners, who themselves are selected based on their affiliation with the two major political parties (one Democratic commissioner and one Republican commissioner from each borough, appointed by the county party chairs). “We’ve been asking them to end patronage since I got into office,” Kallos said.“State lawmakers need to amend the state law that allows BOE to have a patronage system and replace it with a civil service system - the same system that we used to root out patronage from Tammany Hall." What’s needed, Lerner says, is a system that chooses people to administer elections based on their experience administering elections or managing complex systems, not a system in which local political parties use patronage to reward party loyalists. “Ultimately, one would hope that the executive director would be where the buck stops,” Kallos said. Yet, at an executive budget hearing in May, Kallos was “disappointed to learn that the executive director can’t fire his employees, and despite the problems of the last election,” two of the people who were responsible “remain suspended without pay, but not terminated.” Since the executive director doesn’t have the power to terminate employees, the “ten commissioners need to be held accountable, if they refuse, then it goes to the County Chair who appointed them,” Kallos said. While Kallos sees “overlapping responsibility for the BOE,” Lerner believes “there isn’t actually any real authority,” as “the BOE is a highly politicized body and election law has deliberately set it up so that it really isn’t clear who it is answerable to.” The chairs of the election law committees in the Senate and the Assembly are Senator Fred Ashkar and Assemblymember Michael Cusick, neither of whom responded to requests for comment for this article. De Blasio, Gianaris, Kallos, Lerner, and others view the patronage system as the root of the problem and the cause of the BOE’s persistent failures when it comes to administering elections and performing its other duties. There is a strong sense among those who spoke with Gotham Gazette that the city BOE is not accountable to the voters; that it is accountable to the county party chairs; and that the people who could improve the structure of the BOE don’t have any incentive to do so. A number of city officials and agencies, like the City Council and the DOI, have repeatedly recommended replacing this patronage system with merit-based employees, which would require changing state election laws and amending the state constitution. In the meantime, people like Gianaris, Friedman, Kallos, and others are looking to get other changes to state law passed that would also improve the way elections are administered. Bills have been introduced in the Senate and the Assembly to make voter registration automatic, expand online voter registration, allow early voting, extend registration deadlines, consolidate the state and federal primary election dates, improve New York’s confusing ballot design, and more. One of the more comprehensive pieces of voting reform legislation currently introduced in Albany is the Voter Empowerment Act (introduced by Gianaris in the Senate and Assemblymember Brian Kavanagh in the Assembly (Kavanagh was not made available for comment). Kallos has introduced a resolution in the City Council calling on the state to pass the act). The Voter Empowerment Act seeks to update New York’s registration process by expanding online registration and modernizing the way voter information is collected, processed, stored, and shared. Gianaris calls the VEA an attempt to improve the way elections are administered, “getting at it from the point of view of not really tackling the structure - which is a huge can of worms - but just trying to get at some of the specific ways we can change the laws to make it easier” to register to vote and to maintain accurate voter rolls. Should the Voter Empowerment Act pass, the legislation would improve the accuracy of New York’s voter rolls by reducing the number of outdated or duplicate registration records. Ryan has said that the purge carried out by the Brooklyn BOE office was a response to the DOI’s 2013 report slamming the board for failing to remove ineligible voters from the rolls. For now, Lerner, Friedman, and others say the voters should stay mad, keep attending BOE weekly meetings, and keep the pressure on those who have the ability to make a difference: the BOE commissioners and state lawmakers. Since the last NYC Votes trip to Albany lobbying for better voting laws,19 more sponsors have signed on to the VEA, and 17 new sponsors signed on to the Voter Friendly Ballot Act. Thirty-seven additional sponsors signed on to early voting bills, which have now passed in both the Senate and the Assembly election committees. “New Yorkers should be pressing all of their leaders, including in Albany,” de Blasio said. ”We call ourselves a progressive state but when it comes to electoral reform we are fundamentally backwards. I think the people are going to rise up on this one." With four agencies testifying over the course of several hours, a Friday executive budget hearing held by the City Council’s governmental operations committee, along with the finance committee, had a lot of ground to cover on important issues like election administration and law department function. Two of the agencies testifying have even been sources of controversy in recent months and the hearing was an opportunity for Council members to air their concerns and get some answers. At many points during the hearing, however, agency officials had little to offer and major questions were left unanswered. The hearing included testimony from the city Board of Elections, the Campaign Finance Board, the Law Department, and the Department of Citywide Administrative Services, in that order. Leading the hearing from the Council side were City Council Members Julissa Ferreras-Copeland, chair of the finance committee, and Ben Kallos, chair of the governmental operations committee. Perhaps most crucial were BOE and DCAS, two agencies which have dominated headlines in recent months -- the BOE for its shoddy handling of the April 19 presidential primary election and massive, inappropriate voter purges in Brooklyn; DCAS for lifting a land-use restriction that allowed a nursing home owner to sell property to a luxury real estate developer. Both those incidents are being investigated and the City Council will soon hold dedicated oversight hearings. Friday’s budget hearing still provided Council members, and others, the opportunity to ask important questions, even if answers were not always provided. Following the April primary, the BOE has been the target of much criticism. Mayor Bill de Blasio vowed to use his budgetary power to bring about change and followed through with an offer of $20 million in additional funding on the condition that the BOE agrees to a structured plan of reform by June 1. Of this, $1.5 million was included in the mayor’s executive budget with $18.5 to follow if BOE signs the deal. A budget deal between the Mayor and the Council is due before the start of the new fiscal year on July 1. At Friday’s hearing, BOE Executive Director Michael Ryan couldn’t say where BOE commissioners stood on the proposal since they had yet to analyze it in detail. “Once the details of the proposals have been fleshed out, they will be shared with the commissioners and, ultimately in a quasi-legislative process, the commissioners will have to pass on that either in totality or in part,” he said. Ryan also couldn’t say whether the BOE would consider replacing patronage positions with professional employees selected through an open-hiring process, a top priority for Council Member Kallos and several of his colleagues (it is also something de Blasio has called for). This authority, Ryan insisted, lies with the BOE commissioners, who are borough-based. The structure of the BOE is also dictated by state law, which de Blasio and others say they want to see changed. Kallos was less than satisfied with Ryan’s testimony overall. “I got the answers I have learned to expect, but not the answers that I wanted or needed,” he told Gotham Gazette during a break in the hearing. The Council’s three major issues with the Law Department budget are the projected cost savings in the judgement and claims budget; the financial implications of a recently settled lawsuit against the city; and the department’s contracting with two outside law firms to represent the city in two investigations into Mayor de Blasio. Law Department officials couldn’t explain how their judgements and claims budget included $430 million in reductions over the next five years. In the preliminary budget, it was projected to increase from $746 million in Fiscal 2017 to $855 million by Fiscal 2020. They also couldn’t say if a recent $140 million judgement against the city in a case concluded in February 2016 was included in this year’s budget. When Council Member Ferreras-Copeland asked about the calculations that went into these figures, managing attorney Muriel Goode-Trufant said, “We do not know.” She said these decisions were made by the Office of Management and Budget after considering input from the Law Department. “You do not know? That’s awesome,” Ferreras-Copeland responded sarcastically, promising to follow up with OMB director Dean Fuleihan. Kallos was also interested in knowing how much it would cost the city to contract with the two law firms to defend the mayor and the city. Again, agency officials were scant on details, insisting that the process was ongoing and they had yet to assess the final costs. “The taxpayers could be on the hook for millions?” Kallos asked. “We, at this point, don’t know,” said Georgia Pestana, first assistant corporation counsel. DCAS is a little-known city agency that manages the city workforce, property and buildings, and fleet of vehicles. Last year, the agency lifted a deed restriction on Rivington House, a nursing home in Manhattan’s Lower East Side, which allowed its new owner to make millions in a sale to a real estate developer. Essentially, the property was flipped and in the process, what had been a nursing home was to become luxury housing. As expected, many questions from Council members to DCAS Commissioner Lisette Camilo revolved around the way DCAS handles deed restrictions. Camillo would not address the Rivington deal directly, since it is under investigation (several entities at various levels of government are investigating the deal). “In order to protect the integrity of the investigation, I’m not going to be able to answer questions specific to that,” Camillo said. But she did explain how deed restriction payments are evaluated and where DCAS revenue is reflected in the budget. Naturally, a similar deed restriction sale in Harlem, reported by the New York Times on Friday morning before the hearing, raised more questions about how many deed restrictions the city is considering and how many it had lifted in the last few years. Camillo told Council members that current requests for changes in deed restriction had been put on hold, about 14 in all, and the process was being reviewed. The Campaign Finance Board testimony was quick and included the least drama, though there are reforms to the city’s system being considered - the bills were the focus of a recent Council hearing - read about those here.